Sea | Ojo De Piedra – Eye of Stone. Healing waves, gift of the beauty of Life. Ever wondered how to regain the innocence and sense of wonder a child has? I got a clue a couple of days ago, perhaps it works for some of you too. The Sea, always a mystery, always inspiring, always absolutely awesome, always the same and always different, one of the greatest forces of our Mother Earth! In my healing and recovering journey going for a run has been one of the practices that really have helped me to fight the darkness. Running along the beach is even more rewarding!, next to where the waves brake, watching and feeling the Ocean’s vastness, filling up my lungs breathing deep the salty air, feeling the warmth of the Sun and the fresh touch of the water on my skin, the texture of the sand below my feet, all gifted me with a dose of the beauty of Life, and the things that really matter in it. This entry was posted in Broken Light, Health, My Life and tagged Breathing, Changes, darkness, Healing, Life, mental health, Ocean, Recovery, Reflections, Running, Salt water, Sea, Training, Waves on February 6, 2017 by Eduardo Mendoza. Probando el surfear. Trying surf. A couple of kids defy the power of the waves as the sun goes lower at the Pacific coast of Guerrero, Mexico. In recent days temperatures are getting higher again, heat in the afternoons really wake up the desire for being at the beach. Here is an image I found from back in september 2008, a trip to Guerrero, Mexico celebrating my birthday. I spotted in the distance these two kids playfully having fun with the waves from the hotel’s room, and couldn’t resist photographing them with my Nikon D200 and a Nikkor telephoto, since they were not so close from where I was watching them. 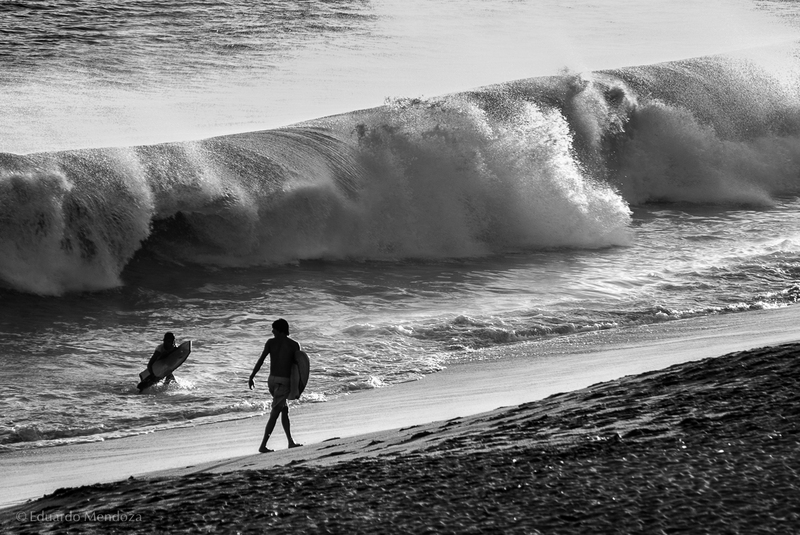 This entry was posted in Photography, Travel and tagged Afternoon, Black&White, D200, Fun, Guerrero, Heat, Kids, Mexico, Nikkor, Nikon, Sea, Surf, Telephoto, Waves on July 28, 2015 by Eduardo Mendoza.